Sunday turned out to be a work in the yard all day. Managed to get the rest of my garden in. There was also lots of other things to do out there so by the time I came back inside I was tired. My dear sweet husband made Indian curry for dinner instead. So I promised to make dinner Monday night. Monday-tonight, I call it a success for dinner. 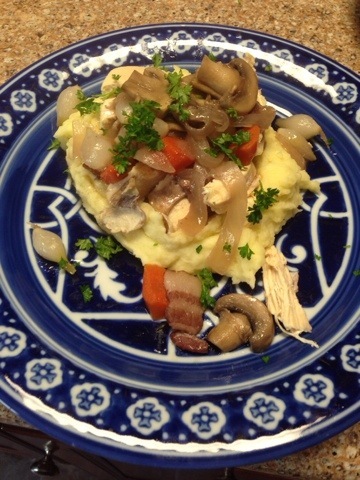 I made Coq au Vin and it was tasty. Also made garlic golden mashed potatoes as a base. My family was so stuffed that dessert was not to be had. I used my favorite red wine. Cupcake’s Red Velvet. Now to figure out what my next recipe should be.